For most of this film Noriko (Setsuko Hara) is a happy-go-lucky spark plug of energy with a perpetual smile on her face, but at 27 years old pressure from her father and her auntie to marry takes its toll, eventually stripping the woman of her pride and independence. This simple conundrum fuels this quiet domestic masterpiece from Japanese cinema-giant Yasujirô Ozu. Professor Shukichi Somiya (Chishu Ryu) is a widower, left with only his unmarried 27-year-old daughter to take care of him. It’s an honourable duty, which Noriko accepts with considerable pride. But for Shukichi, Noriko needs to be married off to fulfill a life of her own and to appease the social expectations of the family. At first, Noriko, who wears a mask of infectious optimism, is impervious to her father's and auntie’s nudges. But it’s the pressure of her own friends, her peers in whom she can no longer confide, that eventually causes the intense pain and stress she can no longer bear. It’s a remarkable emotional journey delicately executed with the kind of Japanese neorealist sensibilities that Ozu has made his career from (e.g., Tokyo Story, Floating Weeds, Late Summer). The qualities of his most renowned picture, Tokyo Story, notwithstanding, Late Spring connects deeper with its audience. The inter-generational conflict - traditional values versus progressive self-determination - feels as relevant today as in Noriko’s day. Ozu never settles with base characterizations either. It would have been easy to portray the father as a stubborn autocrat unable to adapt to new social mores, and it would have been easy to portray Noriko as the bastion of feminist freedom. Instead, Ozu’s characters are built from the inside out and are more complex than any hip post-collegiate comedy of today - which is how a story like this would be packaged these days. As usual, Ozu keeps his characters’ emotions in check for most of the film - buried deep behind the duty of family. Without words we can sense Noriko’s trembling and painful inner turmoil. Her devotion to her father is heartbreaking. Even when she's expressing deep sorrow her smile breaks through, making her pain that much more sad. The effect of Noriko's smile is much like the final smile in Chaplin’s City Lights. Part and parcel to this delicate balance of emotions is Ozu's trademark visual style, which is in full force here. Immaculate compositions featuring low camera angles, static frames and 180-degree coverage slow down time allowing drama to ooze into our pores. Ozu’s distinct dialogue coverage, shot very close to the actors' eye line, has the effect of the characters looking into the audience’s eyes – a technique also used heavily by Jonathan Demme – which subliminally creates a strong connection between audience and character. Recently many critics have been posting their top ten lists for this decade's Sight and Sound Best of Cinema list. 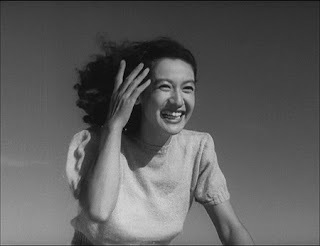 Ozu might again find his Tokyo Story in the top ten, but the earlier film Late Spring is better. It's like a Japanese John Ford film with cinematic tenderness personified, impossible to forget and guaranteed to affect you emotionally. Late Spring is available on Blu-ray from The Criterion Collection. Very nice piece about a wonderful film.